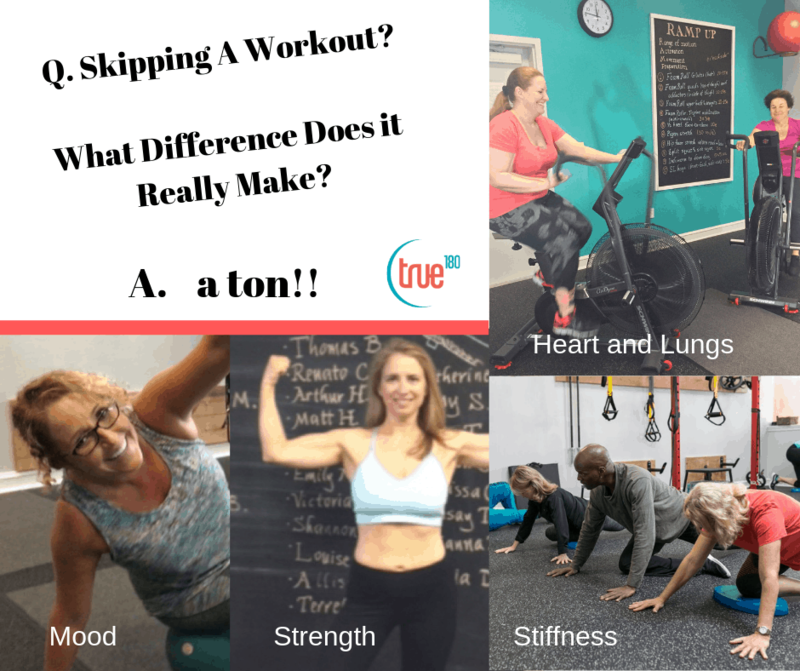 Skipping A Workout? What Difference Does it Really Make? Day 2: your mood and energy levels begin to decline because your body’s endorphin and adrenalin levels have also started to drop. These chemicals are natural appetite suppressants, so your appetite begins to increase. Day 3: your heart and lungs are 5% less fit. Your muscles are measurably stiffer. Day 7: your metabolism has declined some 10% because your ability to use oxygen has declined by 10%. Your body needs oxygen to burn calories. Energy levels are even lower than on day 2. Day 14: your body has started negative recomposition – this is the process of losing muscle and gaining fat simultaneously. By now your heart and lungs have become 15% less fit. Day 21: your metabolism has declined sharply because your body’s ability to use oxygen had declined by 20%. Besides making weight and fat gain more likely, this also decreases your energy levels because your body needs oxygen to make enough energy available to you. Anything that reduces energy levels usually reduces NEAT (an important part of your metabolism). Day 25: you’ve lost 5-10% of your muscle mass. If the scale is the same this means that you’ve replaced your muscle with an equal weight of fat, and fat occupies more space than muscle. Day 29: strength levels have dropped by up to 30%. As you can see, a lot can change in just a month. Here’s a simple, yet powerful strategy to help you be more consistent with your fitness – be specific. Instead of saying “I’ll workout three times this week,” try, “I’m going to workout at my studio on Tue, Thur and Sat at 10am.” Research shows that the latter makes you 220% more likely to follow through because it gives your brain a specific target and contains decisions. Putting off making a decision (such as when and where you will exercise) induces something called “decision fatigue” which depletes your willpower and makes exercise far more difficult than it needs to be. If you’d like an accountability jumpstart, we’d love to help.